Looking for some fun hidden gems in Gatlinburg? We have compiled a list of the top five lesser known, but just as equally fun places for the whole family to see! We included a little bit of everything that’s perfect for all ages. So, if you want to see how diverse the Gatlinburg area can truly be, visit all the places on this list (You won’t be disappointed)! If you have never been to Gatlinburg or Pigeon Forge, get ready to start planning your vacation today and consider renting out a cabin for the best views Gatlinburg has to offer! While the Ripley’s Aquarium of the Smokies is usually on everyone’s list, (and it’s not hard to see why) we want to highlight the other attractions that Ripley’s has to offer. All together, Ripley’s has 8 attractions in the Gatlinburg area. First up is Ripley’s Believe it or Not Museum. This place is 3 stories high, over 12,500 square feet, with 500 exhibits and artifacts! They showcase everything from ACTUAL shrunken heads, to a real vampire killing kit. Several of the exhibits are completely hands on and interactive as well. Next up is Ripley’s Guinness World Records Adventure. This museum has great photo opportunities before you even start! Showing off hundreds of world records and authentic memorabilia, this place is open every day of the year. The best part? Inside there are over 20 interactive games and challenges. There is even a huge interactive room where you can attempt to break some of the world records. Lastly, the smaller, but just as fun, attractions of Ripley’s includes a 5D moving theatre ride (this can be very jerky, so be advised! ), a Haunted House attraction, The Ripley’s Mirror Maze (which comes with entrance to the Ripley’s Candy Shop), and the Ripley’s Mini Golf Course which comes with two themed courses and 36 holes of fun for the whole family! A trip to Gatlinburg is not complete until you visit the Smoky Mountain National Park, but sometimes the crowds can take away from the beauty and serenity that the Smokies have to offer. So, we are here to tell you, there is another way! There is a secret entrance into the park that typically only locals know about. It is on a beautiful, scenic road that takes you over the river and through the woods. It’s called the Wears Valley entrance or the Wears Cove entrance. It has started to grow a little in popularity lately, but is still the best entrance to beat the crowds. So now you are in the park. Where to next? The National Park owns roughly 500,000 acres of the Great Smoky Mountains. There are hundreds of trails to hike and tons of wildlife to see. It would be perfect for a great outdoors experience with the family. Pack a lunch, take the secret scenic route, and have a beautiful little picnic while you discover all that nature has to offer! Is your family looking for a unique adventure? Perhaps something other worldly? MagiQuest is your spot! You start off creating your character. Then you get your very own wand and go into a room where you learn how to use it! You literally point the wand at stuff to get points or collect items! Once you get the hang of it, your adventure awaits. You start off by waving your wand at a screen in the Quest area. There are screens at various heights so anyone can play. You choose your quest, and go off to scavenger hunt for the items! You purchase by the hour, but that hour goes quickly! Didn’t finish all of the quests? That’s okay! MagiQuest saves your information and game play for up to two years! There is more to do than just the scavenger hunt. You can purchase a package that includes all of the activities. This includes the huge mirror maze called the Odyssey (which is a little challenging and fun!) This mirror maze is the largest in the world with over 5,000 square feet. There are several different experiences inside such as the infinity room, or the very fun dance room where the walls react to your moves! The package also includes this fun game called The Vault. You go into a completely dark room and have to get to the back of it as quick as possible and push the red button without triggering the lasers. For every laser you touch, more time is added to your clock. The objective here is to be quicker than the others in your group. At the end, you can see your score against everyone else’s. Lastly, there is an 18-hole black light miniature golf course to perfectly end your time at MagiQuest. It’s not too difficult but there are some courses that will have you laughing with its pirate theme. Hint: Try to get a Hole-In-One on the 18th hole and Blackbeard and his friends will serenade you! If your family has ever wanted to meet someone famous and get a picture with them, then say no more! Come play with the stars at the Hollywood Wax Museum. This two-story museum is full of wax celebrities, everything from famous singers to actors, to famous characters in movies and tv shows! Located in Pigeon Forge and hard to miss, (just look for the giant King Kong climbing a building) Hollywood Wax Museum is the perfect place to get your goofy and hilarious group pictures! Hannah’s Maze of Mirrors will keep you laughing as you walk through and find out if you are the “chosen one” for the King. Castle of Chaos is a fun competition for the whole group! Create your name, then sit back and get ready to shoot stuff and be moved all around the theatre! Throughout the video, you can see your ranking to know who is in the lead. Outbreak is a haunted house attraction placed into a zombie apocalypse. This one is pretty scary, so if you have smaller children, or people who scare easy and don’t like to be scared, then I would recommend them doing the mirror maze or the Castle of Chaos again in place of the Outbreak. Of course we have to add Foxfire Mountain Adventure Park to this list! (A little shameless self-promotion never hurt.) We have everything a family needs for a full day of fun! We offer 2 breathtaking ziplines for the older, more adventurous crowd. The Goliath is the longest, fastest, and highest in TN. We also have the exciting Canopy Waterfall Tour, which is the only zipline in the Smokies where you can zip over a waterfall! For families with younger kids, we also have five lanes of rock climbing for everyone of varying difficulty from beginners to experts ,and The Bear Crawler, which is an exhilarating 8-wheeled ATV adventure through the woods and mountains! Not as adventurous as others in your family? That’s okay! We have scenic hiking trails, animals to see, the rope obstacle course, and America’s longest swinging bridge! After all the fun, you will probably build up an appetite. Make sure to stop by our southern BBQ restaurant Zippin’ Pig Barbeque. Afterwards, sip some cider at our Wyile Cider Barn and end the day with some homemade ice cream made right here! We have something here for everyone and all ages! 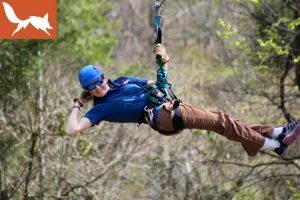 To learn more about Foxfire Mountain Adventure Park or to book your own adventure, visit https://www.foxfiremountain.com/ today!